FIFA season 2018 is back, and everyone is going gaga over it. Wear your favourite team’s jersey and indulge in the madness of football festivity. After a long wait of 4 years, the football enthusiasts are all set to flood the bars in the vicinity of their office. 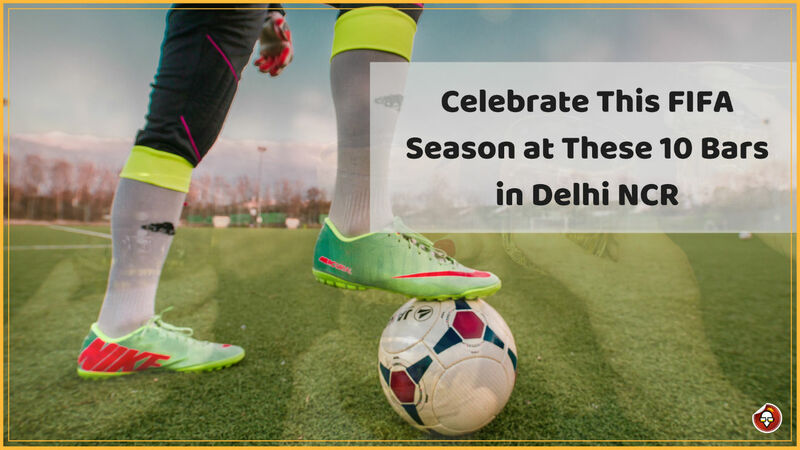 Bars and lounges are jam-packed during most of the major sports season, after IPL, FIFA has come to evoke the madness in football lovers. We know match gatherings are like an unsaid rule for sports fanatics. Looking out for a place to watch FIFA match with your friends? Head to these 10 mind-boggling bars in Delhi NCR and live every moment of FIFA over a glass of beer. Behold the FIFA fever and prepare yourself for football lunacy! It’s the best brewery you will find on Golf Course Road in Gurgaon. Its upbeat ambience with chic interior makes this place perfect for match nights. Grab your beer and cheers to the goals your team will score tonight! The moment you’ll step in this place, you will fall in love with it. Everything about this place is magical, be it its multi-cuisine food, mind-numbing spirits, or its dazzling ambience. Wandering on the busy streets of Sector-29 market and wondering where you can go to watch the match? Philtre is the place for you. Head over there, and you will not be disappointed. Football matches are more fun when accompanied by good music. You wouldn’t find a single bar that can beat Boombox Brewstreet when it comes to music. This eccentric bar is all about food, alcohol, and music. Now, add this fanatical mixture to FIFA fever; what do you think will happen? It will take your whole match-watching experience to sky-high level. Hauz Khas is the hub for night owls, and Social is for mad party seekers. Bring all your friends and watch your favourite team playing with your friends. Their food and refreshing bar menu will add up to the already majestic ambience created by football fanatics. It’s popular for its high-end fine dining experience. But what people don’t know is that this place gets all fanatical during the FIFA season. Their lounge section is all packed during major sports seasons. Their courteous staff and genius chefs are always on their toes to make the whole match-watching experience memorable. You must have already heard this name many times through your friends. Famous for its sumptuous food and beverages, this place is on the favourite list of many sports enthusiasts. After the IPL storm, it’s all set to welcome the FIFA tsunami with best of its food and drinks menu. Beer and football matches go hand in hand. If you don’t believe us then go ask any football fan, and they will tell you. You must have understood by the name that the beer you’ll get here would simply be the best. Its charming interiors and delectable food attract many football enthusiasts. So, if you’re are CP and looking out for best places to watch tonight’s match, visit this place! Did you hear about ‘Bet My Tap’? All the beer lovers in Delhi NCR, the Beer Café is calling you out to bet at your table and predict the score of tonight’s match. If you can predict it right, you can get complimentary brew as a reward. So, wear your jersey, and bet your tap to win some brew this FIFA season. Its idiosyncratic interior and lit ambience are best suitable for match screenings. Are you worrying about missing tonight’s important FIFA match? Head straight to the sector -38, Jokers is welcoming all the football lovers with open arms. Their bar menu has everything you would need to make your match hours merrier. Being the new entrant, it has gained a lot of popularity in a short span of time. A super spacious bar with pulsating interiors, it gives a warm vibe. They offer an eclectic menu with a variety of food and spirits to choose from. This FIFA season, enjoy their delectable food and celebrates the football fever. Everyone is down with FIFA fever, and it’s going to stay like this for a while. In a country where Cricket is worshipped like God, football has crept throw cracked walls and stole the hearts of many Indians. If you are part of that crowd who breathe-in football like oxygen, then plan your match outing with your friends right now! Go out and celebrate this season with your fellow football fanatics over a mug of beer. This entry was posted in Restaurants and tagged bars in delhi, delhi, fifa 2018, gurgaon, live sports screening. Bookmark the permalink. Which are the Best Venues in Gurgaon to Host a Corporate Party for 50 to 150 People?